The Infoprint 2105ES can help transform your business to become more competitive and win in the marketplace. In addition to printing at 105 IPM the printers have an 80 IPM integrated networked scanner that supports digital copying at 105 copies per minute. The InfoPrint 2105ES has a high-performance controller with an 800 MHz PowerPC 750FX processor with 512K of on-chip L2 cache, and a 133 MHz data bus. The controller has an onboard 10/100/1000BaseTX Ethernet attachment and a Peripheral Component Interconnect (PCI) Bus for an optional token ring adapter. IBM AFP/IPDS: Infoprint 2090ES and 2105ES support IBM’s AFP/IPDS with the optional IPDS feature. The PostScript Japanese feature includes Double Byte Character Set DBCS support with Morisawa fonts (GothicBBB-Medium and Ryumin-Light). This feature should only be ordered if double byte support is required. PCL/PostScript is a prerequisite for this feature. The Japanese PCL/PostScript feature is tied to a specific machine and is not interchangeable with other Infoprint 2090ES and 2105ES machines. 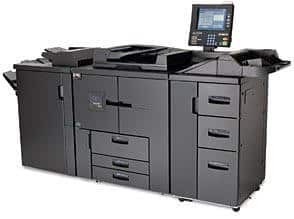 The Infoprint 2105ES come with 3,000-sheet input capacity standard. This capability includes three input drawers. An optional 4,550-sheet High Capacity Feeder with three drawers is available and also an optional auxiliary tray is available which increase the maximum input capacity to 8,050 sheets. An Interposer tray is also available. Duplex capability comes standard with both printers. The Infoprint 2105ES offers high-quality print resolution of 1200 x 1200 dpi. Both printers support up to 256 levels of gray for IOCA images. 1,000,000 impressions. IBM does not recommend printing to this monthly maximum on a consistent basis. original is created that can be printed on these printers. pages up to 80 PPM (8.5 x 11 inch or A4). The ARDF can handle a wide variety of paper sizes from 5.5 x 8.5 inch (140 mm x 216 mm) to 11 x 17 inch (279 mm x 432 mm). Up to 12 x 18 inch originals can be scanned on the glass. digital scanner, a top-notch printer, and exceptional function creates an extremely effective tool for any business.